These two-tone earrings were inspired by ones I’ve seen in the retail fashion shops. River Island had a pair with metallic chain dipped in neon colours. Topshop had a pair with mixed metallic colours. I like these earrings a lot and been meaning to make them for a while now. Whenever I have an idea, I often wonder if someone else has tried to make the same thing. And yes, often, other people have. Nothing is new and more and more people are trying DIY fashion. Which is great news. But what always interests me is how someone else creates the same thing. This blogger – see here – used a ready made pair of earrings which she painted with nail polish. 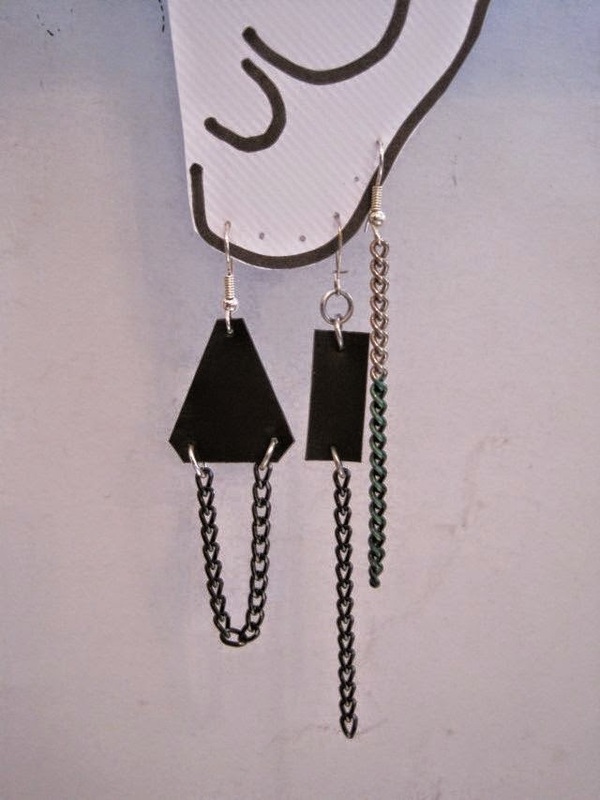 I wanted to use chain for my earrings, which I bought at B and Q, but most hardware stores have varieties of chain. I later discovered black chain at a hobby craft shop. Here’s how I made these earrings. First make sure your chain is free of any grease or oil. A rinse in soapy water should be enough. Allow your chain to dry. Next you need to decide how long you want your earrings to be. Once you are happy with the length, cut them with the cutter section of your pliers. 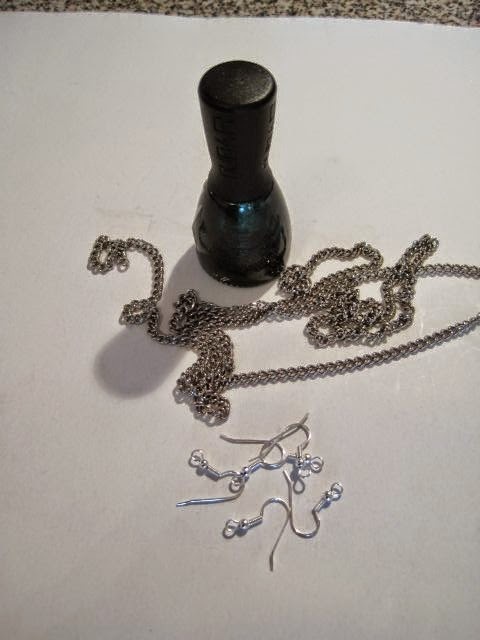 Then dip your two pieces of chain into a bottle of nail polish. 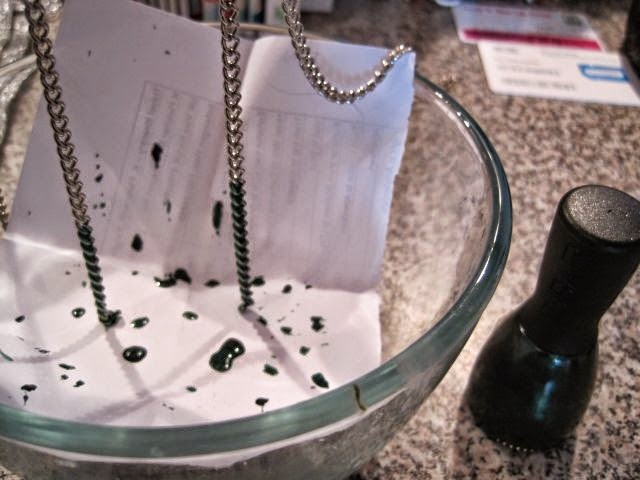 Hold the chain suspended above a bowl lined with paper to catch any drips for a minute or two until the polish has dried. Leave the chain to dry completely before you work with it further. When the nail polish is dry, wiggle the chain so the links become flexible again. The polish won’t crack off if you don’t do too many coats. Lastly attach your earring hooks and that’s it. If you are using silver chain you might try dipping it into a metallic gold nail polish or vice versa. Or look out for coloured chain in craft and hobby shops. 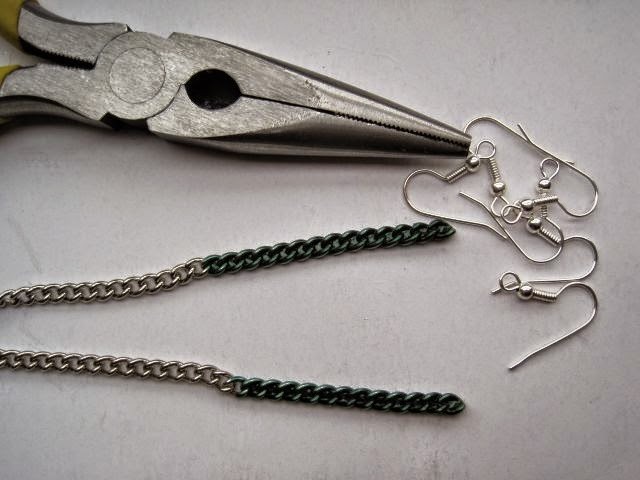 For a more adventurous take you could dip each end in a different colour and leave the middle of the chain free of polish to make a three tone pair of earrings. 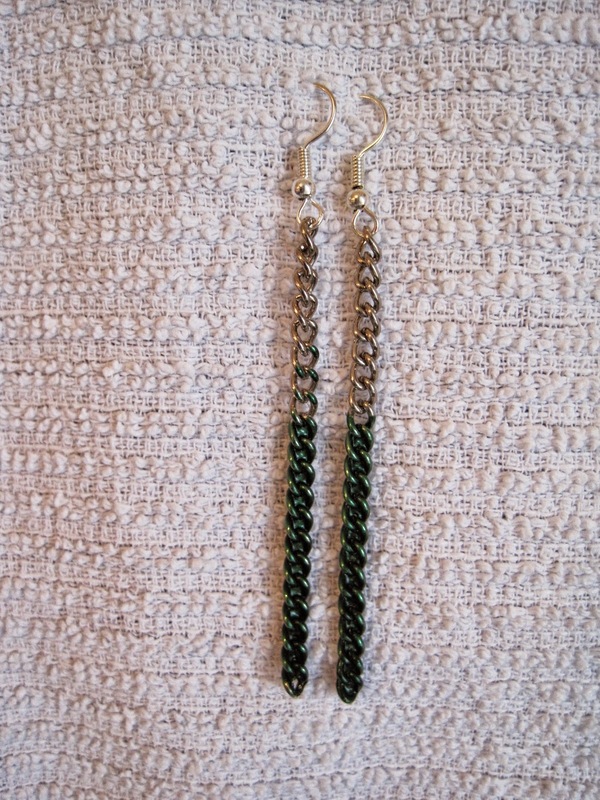 You could also use two or three lengths of chain per earring for an even bolder pair of earrings. In the last pic I used old food containers, I showed how in two older posts, and made a mix of chain and plastic food container earrings. Visit the Greenie Galleries by going back to the top of the page to see older makeovers. And you can share your DIYs on the Greenie facebook page at the top right. This seems very doable for newbies at DIYs. The one where you reused food containers is pretty cool. Thanks for sharing!